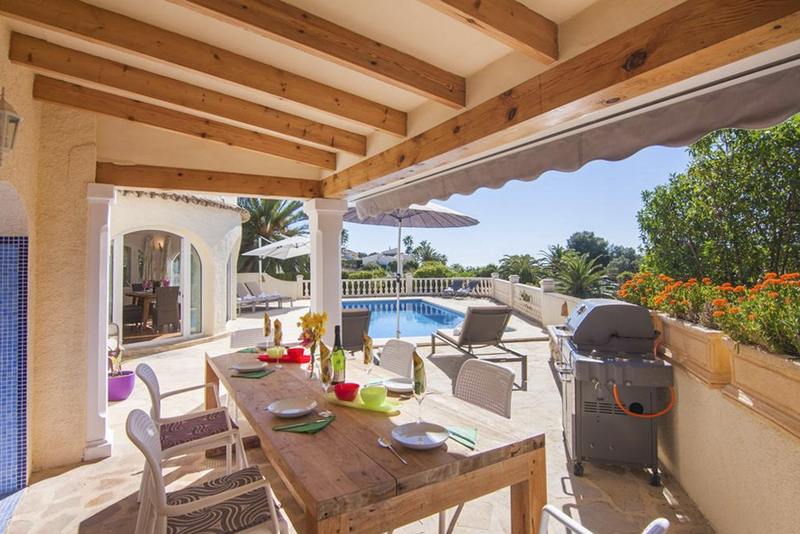 Villa Miguela is a warm, welcoming holiday home nestled within a hillside neighbourhood that’s close to the town of Benissa and several beaches. 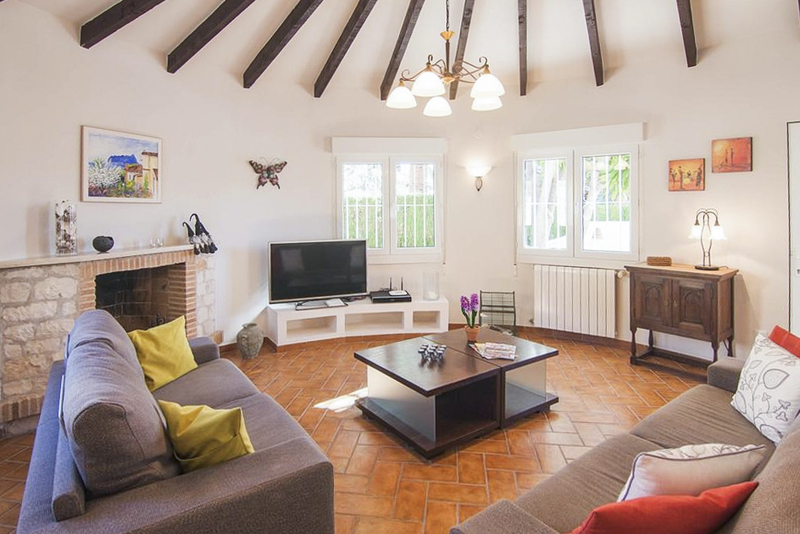 This villa has both a rustic sense of charm and a contemporary style throughout its spacious rooms. 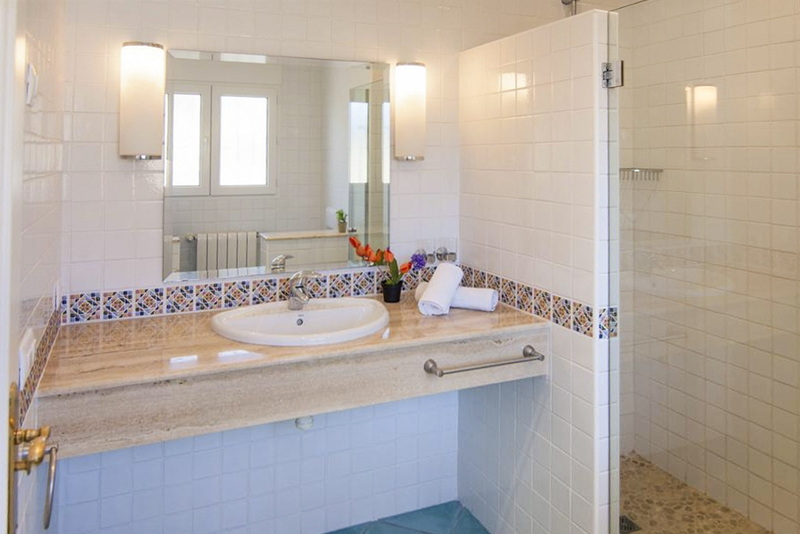 The use of tiles, wood and marble to build and furnish Villa Miguela complements its naturally beautiful surroundings. Stunning mountain, woodland and sea views can be enjoyed from the terrace and first-floor balcony terrace. The villa’s accommodation is set over two floors. On the ground floor is a lovely living room with two large sofas that allow everyone to watch the television together in the evenings. On those cooler nights, you can throw a log onto the fire to create a cosy atmosphere. The room feels open and bright, thanks to the windows that let the light flood in. Walk through into a wonderful dining area with a table that seats up to six people. 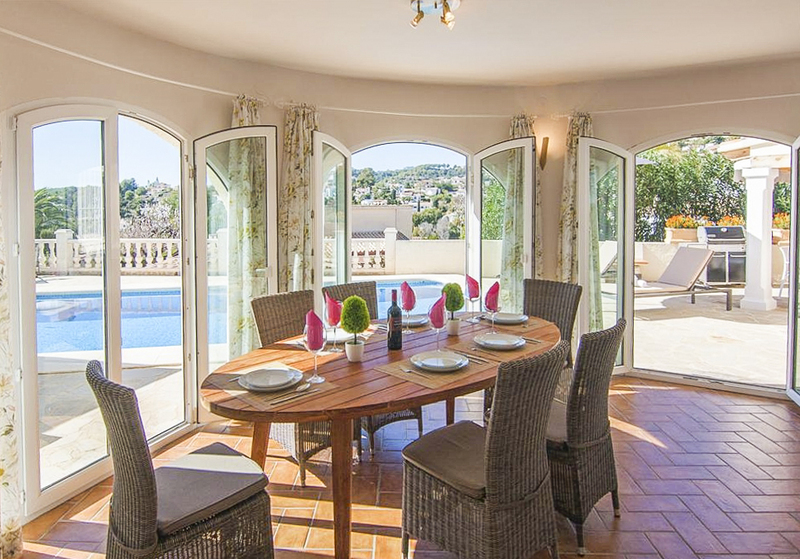 Several sets of patio doors open right onto the terrace, which helps to bring the outside in. Just off the dining room is a kitchen that offers a range of modern facilities to make mealtimes easy. Also on this floor are two bedrooms. One has a double bed and an ensuite bathroom, and the other features two single beds. There’s also a family bathroom with both a shower and a bathtub. To the first floor are the remaining two bedrooms. One has a double bed and access to a balcony terrace with outdoor seating, with the remaining bedroom featuring two single beds. 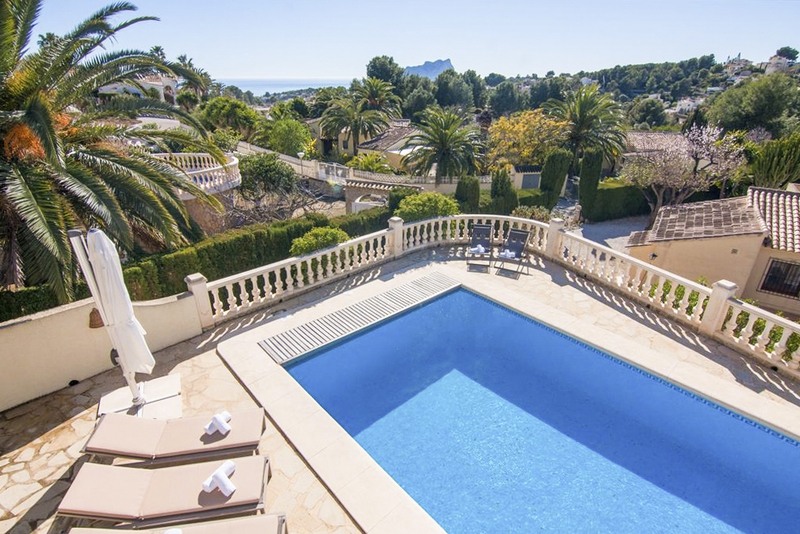 On the main terrace is a private swimming pool that’s surrounded by sun loungers. 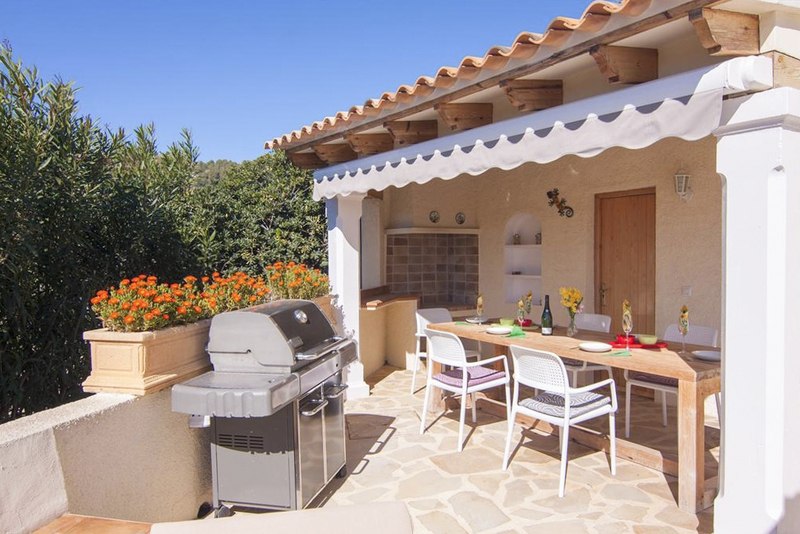 To the side of the villa is a partially-covered dining and barbecue area. It’s the perfect place to enjoy an al fresco meal as you watch the sun setting behind the hills. 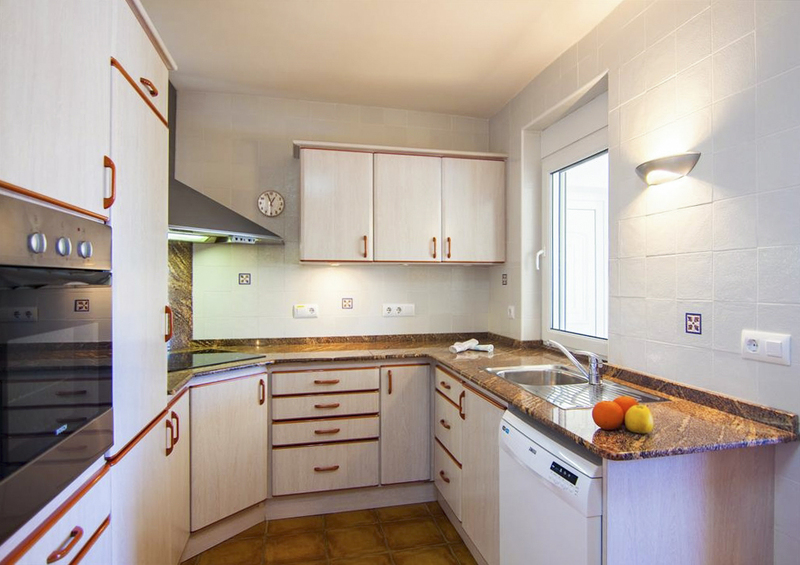 Being within a residential area means that amenities such as restaurants and bars just a short distance from Villa Miguela. Several supermarkets are all within a 10-minute drive also. You don’t have to travel far to get to the coast either, with Cala Baladrar just 2 km away. This quiet, pebbled beach is a great spot to enjoy the tranquillity of the sea and soak up the beautiful mountain views. While it’s not the beach to go to for swimming, the clear water is ideal for snorkelling. There’s a great restaurant serving delicious food nearby. Benissa is one of the Costa Blanca’s oldest towns and is full of interesting historical sites. Take a stroll around the quaint, cobbled streets that make up the old town area, and you’ll come across some fascinating buildings. They include the town hall that was once a hospital during the 18th century and the beautiful neo-Gothic parish church. The seaside town of Moraira is just 4 km away from the villa, so you should expect to arrive there after less than a 10-minute drive. Once a humble fishing village, it’s now one of the most popular resorts in the area. But despite its popularity, it’s still managed to retain much of its historic charm, which can be especially seen in the old town area. Cobbled streets and an old market square allow you to mix with the locals, giving you a sense of a traditional way of life. Be sure to visit Playa de l'Ampolla to enjoy a few hours of relaxing on a sandy beach. The water here is calm and safe for swimming in, but the younger ones might prefer to play in the small stream that leads out to the sea. 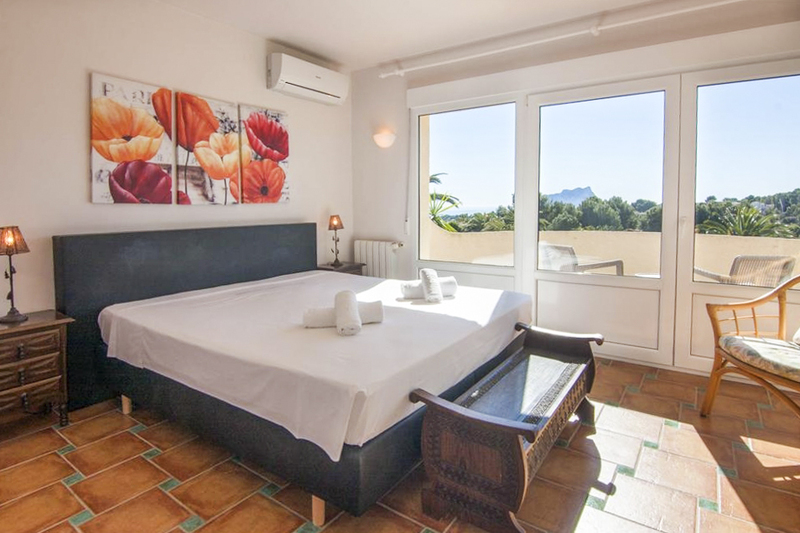 Overlooking the beach is the majestic 18th-century stone fortress of Castillo de Moraira.